Keeping your home or business running smoothly is about more than just organization. To have a happy home or productive business, you need to good morale. That can be hard to do in an unwelcoming environment. Just because you are inside doesn’t mean that you should have to miss out on bright skies and sunshine. Our Hamilton window cleaning can mean all the difference between a dingy room and a bright space. When you want to lighten up your life a little bit, our Gorillas are here to help. The windows around your property provide more than a pretty view. Keeping your windows in good, working order can affect more than looks, but your bills as well. When you are making the most of the days natural light can save on electricity by maximizing lighting and heating. Our Hamilton window cleaning services frames and sills as well. You never have to worry about drafts making you uncomfortable! More so than just adding to your comfort, your Hamilton window cleaning can help protect the structural integrity of your windows as well. It is a universally known fact that glass is fragile. The windows and doors around your property are breakable through blunt force or rogue baseballs but sitting dirt, dust and debris can be just as lethal over time. Glass as a material is porous, meaning that it absorbs anything that sits on its surface. 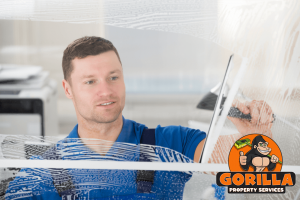 The longer your windows are covered in unwanted dirt, the greater the chance of damaged or broken windows. When you are working or living on the ground level, simply lifting an arm up to wipe a window is easy enough, but what happens when it is higher? Instead of getting stuck with our feet on the ground, we have all the tools to reach windows up to four storeys. When glass is in reach, our Gorillas make use of rubber squeegees and when it is a stretch, water-fed poles lend a hand in reaching new heights.